Diamond introduced a family of solutions for NVIDIA Jetson TX2, TX2i and AGX Xavier modules. Sunnyvale, California — February 26, 2019 — Diamond Systems, a leading global provider for rugged, I/O-rich embedded computing solutions, has introduced a family of solutions for delivering AI-at-the-edge high performance computing solutions based on NVIDIA Jetson TX2, TX2i and AGX Xavier™ modules. The family includes four carrier boards as well as a finished system housed in an ultra-compact enclosure. These solutions target a range of industrial and military applications, with a focus on harsh environments such as vehicles and other outdoor applications. 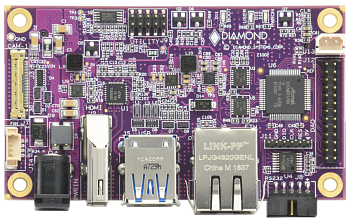 Diamond’s carriers bring out the unique characteristics of the Jetson family of computer modules while enhancing them with additional I/O and features. Ziggy™ and Jethro™ carriers are designed to work with the Jetson TX2 and TX2i system-on-modules (SoM), while Stevie™ and Elton™ provide a platform for implementing solutions with the AGX Xavier high-end module. In keeping with Diamond’s «Rugged I/O» and «2-in-1» philosophies, all products feature data acquisition capability, maximum feature density, and wide temperature operation combined with shock and vibration resistance. Particularly noteworthy among the Diamond family is the full-fledged PCI/104-Express expansion socket present on the Elton carrier. Unique in the NVIDIA ecosystem, Elton bridges the emerging world of AI/ML technology with the long-life, highly successful, rugged industrial embedded computing ecosystem of PC/104. Elton provides support for PCI-104, PCIe/104 type 2 (x8 lane), and PCIe/104 OneBank expansion modules (4×1 lanes), enabling rapid creation of truly rugged, custom-configured, high performance, PCIe-based solutions using off-the-shelf I/O modules from a large number of manufacturers worldwide. The Diamond product family features a compact and cost-effective yet full-featured data acquisition circuit with analog input, analog output, and digital I/O to interface to the «real world» of analog and digital sensors and controls. A programming library provides support for rapid development of custom applications, while a ready-to-run application with graphical user interface provides convenient real-time control of the data acquisition I/O as well as data logging. Ziggy is the carrier for Jetson TX2/TX2i targeting size- and cost-sensitive applications as well as «maker» projects. At 50×87mm, it matches the size of the Jetson modules and provides commercial style connectors for I/O. 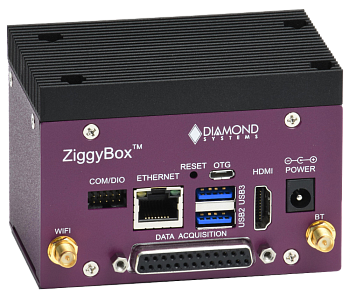 The compact ZiggyBox computer system houses the Ziggy carrier and Jetson module in an ultra-compact enclosure with DIN rail mounting capability. Its compact size lets it fit into crowded equipment racks and cabinets for local AI at the edge / machine learning applications. ZiggyBox sets a new benchmark in combined computing performance, size, cost, and I/O. Jethro, at 76×107mm, is a slightly larger TX2/TX2i carrier that offers far greater I/O and expansion capability, as well as a rugged connector scheme. Jethro includes a PCIe MiniCard socket, an M.2 SATA flash socket, and a LTE modem socket designed to work with Nimbelink SkyWire cellular modems. Jethro utilizes pin headers that can accommodate both low-cost traditional connector technology or more rugged latching connectors where resistance to vibration and shock are required. Stevie is a unique «translator» board that enables the Ziggy and Jethro TX2 carriers to be used with the higher performance AGX Xavier module. The same size as Xavier (87×100mm), Stevie adds an M.2 PCIe NVMe flash socket, 2 CAN ports, and an additional USB 3.0 port, as well as a socket for connecting high performance cameras, thus rounding out the TX2 carriers to provide a complete platform for taking advantage of Xavier’s superior performance and features. 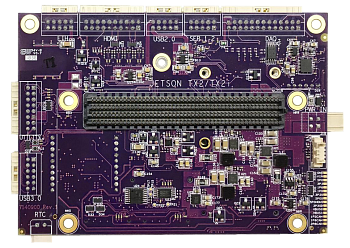 The crowning member of Diamond’s NVidia family is Elton, the full-featured, rugged carrier board for NVidia’s Xavier SoM. Elton utilizes a 50% thicker PCB, latching connectors, and the rugged PCI/104-Express expansion bus to create a rugged platform ideal for the most demanding compute-intensive harsh-environment applications. Elton’s larger size of 102×152mm allows it to include all the I/O and expansion of Diamond’s other carriers: data acquisition, M.2 and PCIe MiniCard sockets, and LTE modem socket. Celebrating its 30th year, Diamond Systems Corporation is an innovator of compact, rugged, board and system-level real world embedded computing solutions to companies in a broad range of markets worldwide. In addition to complete system-level solutions, Diamond’s extensive product line of compact, highly integrated solutions include Nvidia Jetson and Xavier carrier boards; single-board computers (SBCs); an extensive line of expansion modules for analog and digital I/O, wired and wireless communications, GPS, solid-state disk, and power supply functions. In support of performance-critical embedded application requirements, these products are engineered to operate reliably over wide operating temperature ranges, such as —40°C to +85°C, and at high levels of shock and vibration. Additionally, the company offers a comprehensive hardware, software, and system integration and customization services.